GigaMux 3300 provides access to individual DWDM channels within fibre connections. GigaMux 3300 is an Active DWDM device – meaning that it takes care of the application of individual wavelengths or ‘colours’ to the incoming signal from client equipment such as Routers, Servers, Legacy equipment etc. It also provides additional features such as Wavelength demarcation and performance monitoring, Sub-wavelength multiplexing (several channels within an individual wavelength and advanced optical networking features such as long distance connections using Optical Amplifiers and local channel add and drop Flexible OADM capabilities. It is also able to support Layer 1 encryption. GigaMux 3300 comes in several chassis depending on application – 2U and 6U and even larger still if needed – and it can be configured in many different ways depending on the requirement. 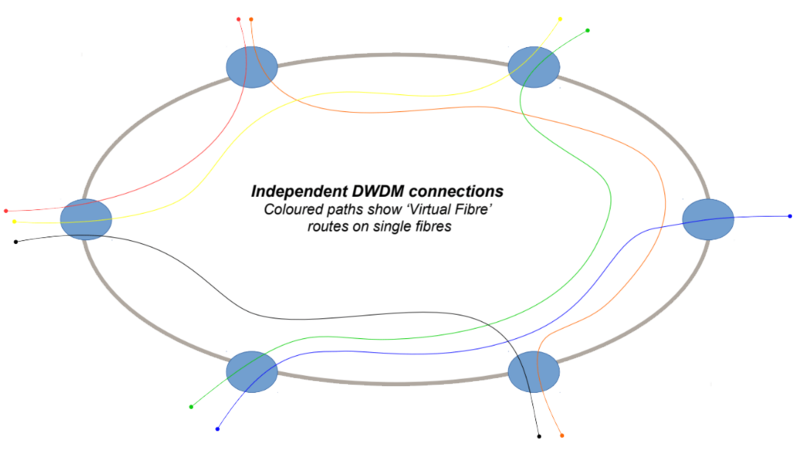 As well as simple point to point connections GigaMux 3300 can also build complex networks such as rings and meshes on the same fibre using OADM technology that avoidsthe need for electronics at intermediate locations which improves space and power utilisation while improving performance parameters such as Latency.